Don’t miss the next book in the beloved MacKade brothers series from #1 New York Times bestselling author Nora Roberts. Sheriff Devin MacKade has always known his destiny was to serve and protect the small town of Antietam, Maryland—and for a long while he thought that future would include Cassie Connor. She’s the only woman he has ever loved, but he’d never worked up the nerve to tell her. When Cassie married the wrong man, Devin did the honorable thing and kept his feelings to himself. Now that Cassie’s divorced, Devin can finally follow his heart. Question is, can Cassie? Does Nora Roberts ever write a bad story? If so, I haven’t read it. Ms. Roberts clearly and compassionately weaves the story of a man in love who finally believes the time is right to show his love for a woman. The woman (and her two children) are learning to trust others after escaping the extreme abuse of the husband/father. A warm and loving story but with nothing spared as to how abuse wrecks havoc on so many lives. Completely satisfying read. 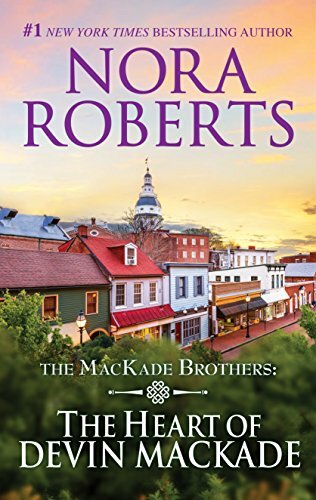 As I have noted many times before, I appreciate Ms. Roberts’ entwining the lives of the MacKade brothers along with their families within this series. Devin was #3 of 4 MacKade brothers. They were all wild in their youth. Always looking for a reason to pound on each other as brothers do. So when he grew up…he became sheriff. Devin loved the town, the people, and most of all he loved Cassie. He had loved her since she was 16. He had waited one day too late to let her know this and she had gotten engaged to Joe. It was a mistake on her part, because Joe was abusive…physically and emotionally. The abuse had gone on for many years until he attacked her one too many times. He had tried to strangle her and she knew, next time, he would succeed. She had tried to make the marriage work, blaming herself when he got angry and abusive. She divorced him. A year after the divorce, Devin finally gets around to making his feelings known to her. As their relationship develops, Devin realizes he loves her and wants the children, her, family…all of it. Cassie’s daughter, Emma, loves him, but Conner is more cautious. He has only known Joe…and Joe has always been abusive. He doesn’t want another father. He believes fathers and abuse go hand in hand. When Cassie finds out how Conner feels, she ends her relationship with Devin. She won’t put her children through any more stress. Joe escapes the prison work detail, and thanks to the help of his ex-mother in law, knows exactly where to find Cassie and those ‘brats’…. I liked this book because it had ‘meat’ to it. It covered ‘abusive relationships’ which is an all too frequent occurrence. It’s not just a romance story. To Devin…Cassie is his heart. His desire to love, protect and comfort her and her children is very heartwarming. With the help of family and friends, they just might become a family. Devin is a mans’ man…but he also has the heart to be gentle and kind. The Heart of Devin MacKade is part of a wonderful collection of stories, all linked by four brothers who share common characteristics and yet are quite different from each other. Each is, fundamentally a good, dependable, and inherently lovable and loving man. Yet each is also his own man, with a central strong core of compassion, pride, dependability, heritage, courage, yes, and machismo. Also linking the men is their family history of the Civil War battle fields and forests of 1862 Antietam and a great mansion, imbued with an ancient tragedy and ghosts! Four handsome, nurturing bachelors, each with an inherent streak of male testosterone-laden sexism (which all absolutely deny) meet four women, all of whom carry the scars, experiences, and lessons of their own pasts, and all of whom are determined to create a future for themselves as strong, independent, and fulfilled women, willing to share burdens and lives, but unwilling to be dominated in the process. There is, thus, a similarity among the MacKade novels, yet it is the genius of Nora Roberts which, I believe creates the subtle nuances which allow one to differentiate among the stories and their character while simultaneously connecting the dots that make this series a cohesive unit. You really need to read all four of them, and do please make sure that you read them in the order in which they were written. The cross-references and flashbacks will enhance your pleasure (instead of just confusing you) if you read them in this order: The Return of Rafe MacKade,The Pride of Jared MacKade,The Heart of Devin MacKade,The Fall of Shane MacKade.